Annandale Is Reading Away the Winter MinneSNOWta! 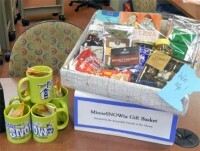 Patrons of the Annandale Public Library are hopeful they will win the MinneSNOWta prize basket. It is filled with wonderful Minnesota products, including syrup and honey produced right in Annandale. Annandale Friends of the Library provided the basket as additional incentive for patrons to take part in Great River Regional Library's annual winter reading program (WRP) which runs Jan. 2-Feb. 29. As of Jan. 12, 100 patrons had registered for the opportunity to win the basket and other great prizes provided by the library, including official WRP mugs and a $25 gift card to the winner's choice of Barnes & Noble, iTunes or Amazon.com. For every five books read or listened to, participants are able to enter into the final drawing. Registration is for patrons who are in 6th grade or older. Registration can be done at the library or online. Read away the winter!